I'd been meaning to read this book for quite some time, so I was glad to finally get my hands on it. High school student Renee Winters is devastated when she finds her parents, victims of an apparent murder, in the woods. Investigators insist that her parents have died from twin heart attacks however, and the case is soon closed. Renee is sent to stay with her eccentric, very formal, old-money grandfather who promptly shuffles her off to Gottfried Academy, an exclusive prep school in rural Maine. There are plenty of mysteriously creepy happenings and strongly gothic vibe to this story. I'm a little disappointed in myself for not realizing that before I picked up the book. 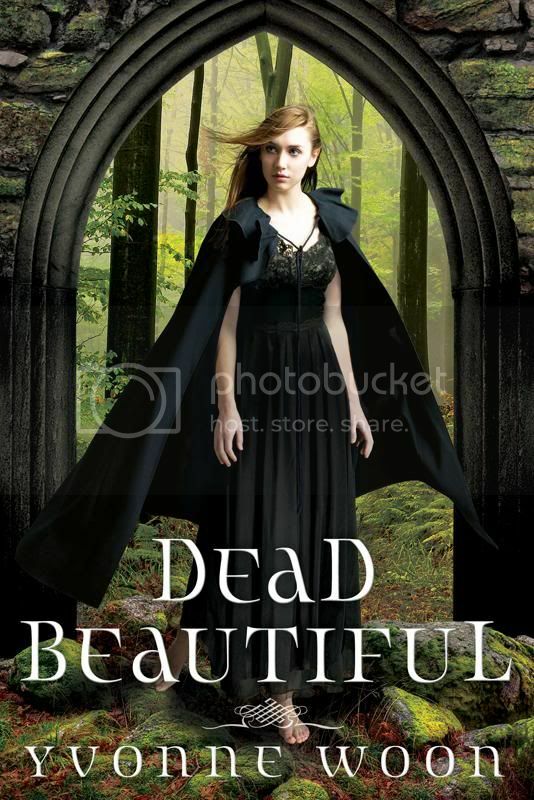 Hellooooo... the clue is right there in the title, Dead Beautiful. While Renee is busy in philosophy, Latin and botany classes at her new school, she finds she has an uncanny knack for sensing death around her - always noticing roadkill, or a dead deer near campus and the like. She is soon drawn to Dante, a taciturn loner at school. Twilight's Team Edward fans will find a lot to like in the intensely passionate and distantly perfect Dante. I had a few things to nitpick about the book. Is it petty of me that I was bothered by the fact that the front and back cover show a forest... of the same tree that's been photoshopped over and over again? I wished the setting in the story had been just a little more distinct. We certainly get a feel for the layout of Gottfried Academy campus, but I wished there had been a little more about the fact that the majority of the story takes place in Maine. Some tension between the "townies" and students perhaps? A colorful local with a trademark Maine accent, or more description of the surrounding pine forests would have gone a long way with me. Really, I thought this story could have taken place nearly anywhere. Slowly but surely, Renee manages to unfurl clues that tie together her parents deaths and the deaths of other students at her school. It turns out that throughout human history, we have created elaborate burial and/or cremation rituals as a way of combating revenants. Anyone who dies before the age of 16 and isn't properly buried will come back from the dead, usually unaware of their undead status. It turns out that Renee is one of a handful of rare individuals who have the ability to sense this, and to put souls to rest for good. This plot point truly strained my suspension of disbelief. If that were true, wouldn't masses of undead children make themselves known every time there was a natural disaster? Nevertheless, I'll recommend this to Twilight fans or any other teens looking for paranormal romance featuring true love between soulmates without a love triangle. Nice review. I agree, it could have taken place anywhere in New England. I wasn't completely sold on the logistics of the paranormal reveal, but I did like learning about it. Yeah, I don't know if I'll ever be completely sold on vampire romance. I keep thinking, "Oh, honey, what are you doing? Your boyfriend is all cold and dead. And he's really, really much too old for you."